Goodbye subpar 200 calorie bars. 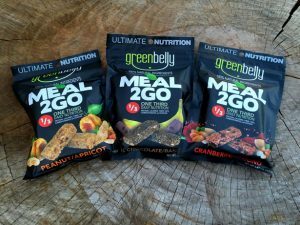 Each Greenbelly Meal pouch contains two meal bars that provide a whopping 650 calories AND a completely balanced nutritional profile. As in 33% of your Daily Nutrition for six core nutrients: Calories, Carbs, Protein, Sodium, Fats and Fiber. Weighing in at 5.64 oz, these things will keep you full while you crush miles. A truly ready-to-eat meal. Just tear open and eat. Even most add-hot-water backpacking meals require cooking… and a stove… and dishes… and cleanup. These babies are good-to-go. Travel light and save time my friend. All natural, fresh ingredients and nothing funky. A light and fluffy texture with whole chunks of fruits and nuts. Greenbelly Meals are gluten free food that won’t hurt your stomach. Might we add that they were formulated by a French-trained culinary chef and taste rather heavenly? Greenbelly was born early 2014 when Chris collaborated with a food scientist and a culinary chef to develop the ultimate on-the-go meal replacement bars packed with all-natural gluten-free ingredients with no artificial preservatives to provide all the nutrition necessary to sustain a body, especially during extraneous activities like endurance training, backpacking and cycling. In April of 2015, Greenbelly launched a Kickstarter campaign that afforded them with the resources to scale the company and increase the size of their production facility. They also took the opportunity to further improve on their flavors, new resealable packaging, and develop a new website. Meal2Go bars are packaged in a durable resealable pouch for those times when you need to ration and are available in three great-tasting flavors including Cranberry Almond, Peanut Apricot and Dark Chocolate Banana. It is important to note that the bars are vegetarian-safe, and all but the chocolate chips in the Dark Chocolate Banana bars are dairy-free. Each 645-calorie serving consists of two convenient-to-eat 72.5-gram meal bars that provide 33% of the recommended daily value based on a 2,000-calorie diet for six core nutrients: calories, proteins, fats, fiber, sodium, and carbohydrates. That equates to 17-grams of protein, 22-grams of fat, 110-grams of carbohydrates and 790mg of sodium per serving. My favorite flavor of the three is definitely the Cranberry Almond. 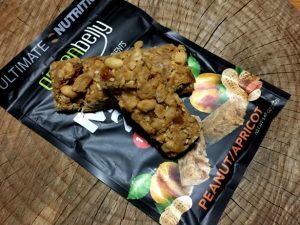 It has a bright cranberry flavor with just the right balance of sweet and salty, and plenty of crunch without being too dry from the first bite to the last. I felt satisfied after eating just one of the bars. But after eating the second, I felt completely full for hours thereafter. In addition to the core nutrients that it provides, the Cranberry Almond bars also contain a healthy amount of Vitamin C, Calcium and Iron. The Cranberry and Almond ingredients include: Organic Tapioca Syrup, Dried Cranberries (Cranberries, Sugar, Sunflower Oil), Peanut Flour, Brown Crisped Rice (Brown Rice, Brown Rice Syrup, Salt), Environmentally Sourced Organic Palm Oil, Gluten Free Oats, Sunflower Seeds, Brown Rice Flour, Organic Raisins (Raisins, Sunflower Oil), Sliced Almonds, Honey, Organic Agave Nectar, Organic Vanilla Extract (Vanilla Bean Extractives, alcohol, water), Organic Sesame Seeds, Sea Salt, Organic Beet Root Powder, Natural Flavors and Mixed Tocopherols. The Peanut Apricot flavor is easily my second favorite of the bunch. The apricots are not as sweet as the cranberries, and the peanuts are much more salty than the almonds. But not so much that it was overbearing. In fact, I found it to be a rather tasty variation that was easily as satisfying. In addition to the core nutrients, the Peanut Apricot bars provide by far the most Vitamin A, Vitamin C, Calcium and Iron of all of the flavors and it is the most nutritious of the bunch as a result. The Peanut and Apricot ingredients include: Organic Tapioca Syrup, Dried Apricots (Apricots, Sulphur Dioxide), Brown Crisped Rice (Brown Rice, Brown Rice Syrup, Salt), Brown Rice Flour, Peanuts, Peanut Flour, Gluten Free Oats, Environmentally Sourced Organic Palm Oil, Honey, Organic Agave Nectar, Organic Sesame Seeds, Organic Vanilla Extract (Vanilla Bean Extractives, alcohol, water), Sea Salt, Peanut Oil, Natural Flavors and Mixed Tocopherols. While the Dark Chocolate Banana bar happened to be my least favorite, it was certainly not lacking in flavor whatsoever. Simply a matter of preference… I prefer the robust fruit flavors to the rich dark chocolate. But I’m sure there are those who would certainly opt for the chocolate instead. 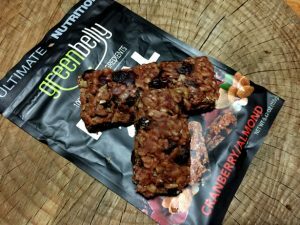 Like the other flavors, the Dark Chocolate and Banana bars are also very satisfying and they provide just as much Vitamin C, Calcium and Iron as the Cranberry Almond bars. The Dark Chocolate and Banana ingredients include: Organic Tapioca Syrup, Brown Rice Flour, Brown Crisped Rice (Brown Rice, Brown Rice Syrup, Salt), Peanut Flour, Banana Chips (Banana, Coconut Oil), Gluten Free Oats, Sliced Almonds, Organic Chocolate Chips (Organic Sugar, Organic Chocolate Liquor, Organic Cocoa Butter, Organic Soy Lecithin, Organic Vanilla), Peanuts, Honey, Environmentally Sourced Organic Palm Oil, Organic Agave Nectar, Cocoa Powder, Organic Vanilla Extract (Vanilla Bean Extractives, alcohol, water), Sea Salt, Dark Cocoa Powder, Natural Flavors and Mixed Tocopherols. 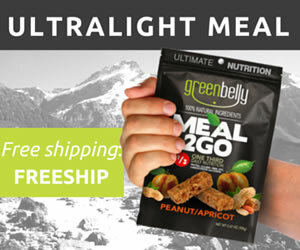 Meal2go bars are always shipped fresh and have been tested for freshness up to 6-months. If you want to store them longer, Greenbelly recommends freezing them. 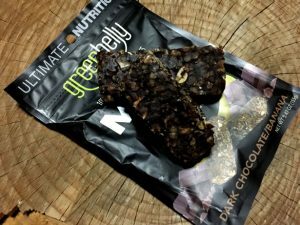 Greenbelly Meal2go Bars are complete nutritionally-balanced meal alternatives that require absolutely no preparation or cleanup. Their small size and ultra-light weight is ideal for athletes and adventurers alike. But they are a little expensive… Healthier options usually are. Aside from the cost, the only other negative for me has to do with the short shelf life. 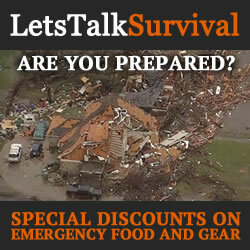 As a result, I would opt for longer-lasting rations to pack in my bug-out gear. But in my EDC and daypack, I like to keep plenty ready-to-eat snacks in them that I can eat on throughout the day when I am out and about so in that case, the shorter shelf life makes little or no difference. 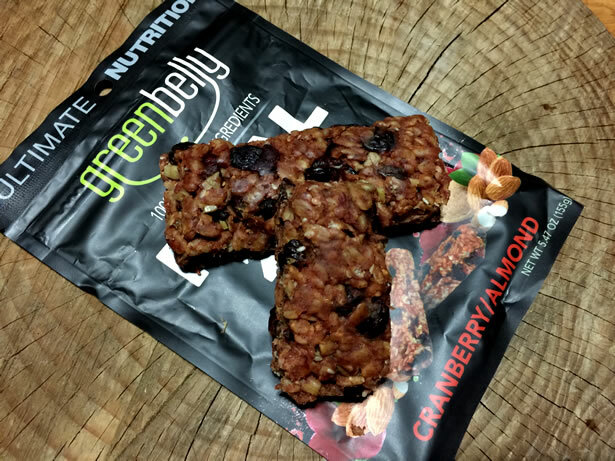 Greenbelly bars are perfect for eating healthy on-the-go, and they do that very well. I really hope to see the cost come down quite a bit and more flavors in the near future. After working with a food scientist and sampling countless recipes, Greenbelly was born in early 2014. We now have three tasty meals in a convenient, non-cook, meal bar form. Using all natural ingredients, each meal provides a balanced ⅓ of your DV for six core nutrients: Calories, Carbs, Fats, Fiber, Sodium and Protein. Yes! Whether we are working long days at the office or hiking in the Andes, our meals continue to provide us with the quality and quick nutrition we need. We are proud to provide this convenient and balanced meal to other busy people and adventurers. We hope you join us!